This Ham and Bean Soup is the epitome of comfort food on your table in 30 minutes! There is Ham and Bean Soup. Then there is Creamy Ham and Bean Soup. 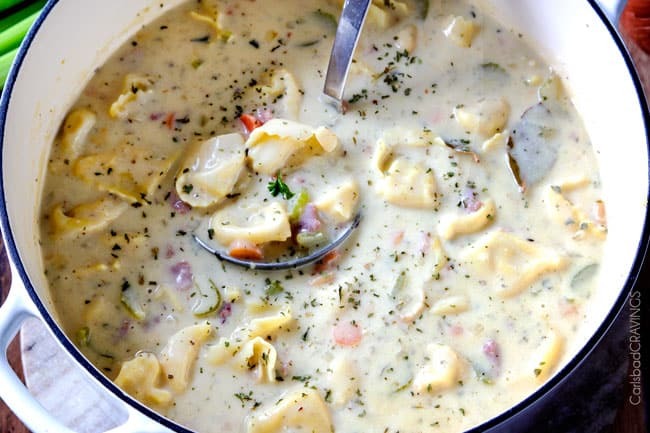 Then there is Creamy Ham and Bean Soup with Tortellini which is 1000X more delicious! This is the Best Ham and Bean Soup simmered with ham, white beans, onions, carrots, celery, seasonings and pillowy, cheesy tortellini. It is lusciously creamy, bursting with flavor, SO easy and lick your bowl delicious! 30 minutes never tasted so good! From my little family to yours, (click HERE for IG pic), I hope you had an absolutely magical Christmas full of the spirit of Christmas, love, and laughter. And ham. 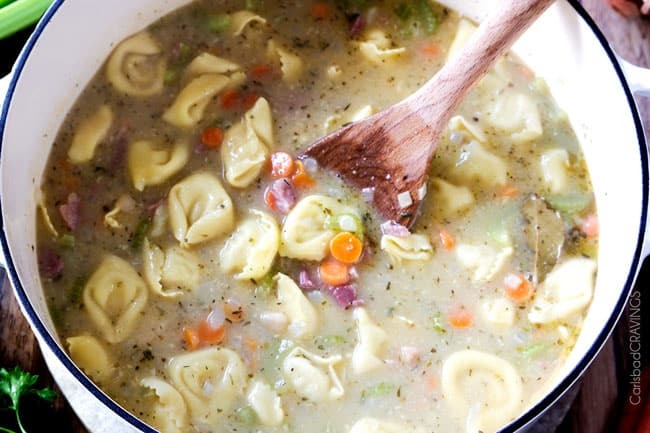 Lots of leftover ham so you can make this Creamy White Bean and Ham Tortellini Soup ASAP, because it too, is magical. Magical in its flavor, texture bursting perfection and magical in its ONE POT preparation – hallelujah! Does it get any better than creamy soups? From my New England Clam Chowder, White Chicken Chili, Slow Cooker Potato Soup to my Chicken Gnocchi Soup, Loaded Zuppa Toscana and now this Creamy White Bean and Ham Soup. It’s warm, comforting, and satisfying, virtually a meal-in-one and crazy delicious. The idea for this Ham and Bean Soup came a few weeks ago when Patrick thought it would be fun to bake a ham, just the two of us. His eyes were bigger than our stomachs – way bigger. I knew immediately I wanted to make Ham and Cheese Breakfast Enchiladas with Creamy Salsa Sauce (a must!) with the leftovers but there were still leftovers – thankfully. It was then time for white bean and ham soup, but not just any white bean and ham soup, but a lightened up creamy soup with pillows of cheese filled pasta because biting into cheese stuffed tortellini makes every slurp better! Consequentially, I think this is the BEST Ham and Bean Soup out there. I hope you agree! What Ingredients are in Ham and Bean Soup? This Ham and Bean Soup is all about building layer upon layer of flavor. Aromatics: The firsts layer comes from aromatic celery, carrots, garlic and onions. If you’re feeling super lazy you can substitute the garlic and onion for 1 teaspoon each powders. Ham: You can use leftover ham OR visit your deli counter and ask for approximately 1/2 pound ham sliced into 1/4″ slices. Now, all you have to do is slice the ham the other direction to create cubes. Beans: I like to use cannellini beans which are the same as white Italian kidney beans. The are available in both dried and canned forms, but for our easy Ham and Bean Soup, we are going to utilize the canned variety but feel free to soak your own dried beans for this recipe if you prefer. Look for dried beans that are glossy and evenly colored for the best flavor. Tortellini: The tortellini in this Ham and Bean Soup elevates it above all others, in my humble opinion. You will need 1 pound uncooked cheese tortellini. Please use fresh, refrigerated tortellini as it is more fresh and tastes far superior than dried tortellini. Seasonings: This Ham and Bean Soup is seasoned with Dijon (because ham and mustard belong together), chicken bouillon, dried parsley, dried oregano, dried thyme ground cumin, pepper, red pepper flakes. It may seem like a lot of ingredients but they are just a quick measure and dump. If you aren’t sure how much red pepper to add, then you can add a pinch then add more to taste at the end of cooking. Chicken Broth: Take care your chicken broth is low sodium otherwise your soup might be too salty due to the already salty ham. Half and Half: I often don’t keep half and half on hand, but keep heavy cream on hand. If you’re like me, you can substitute the half and half with half cream and half milk. For a healthier alternative you may substitute the half and half with evaporated milk mixed with 1 tablespoon cornstarch. Although I am biased to tortellini in this Ham and Bean Soup, you can make Ham and Bean soup with potatoes instead. CAN I ADD VEGETABLES TO Ham and Bean Soup? Absolutely! In addition to the onions, celery and carrots, you can add zucchini, spinach, broccoli, cauliflower, carrots, potatoes, etc. 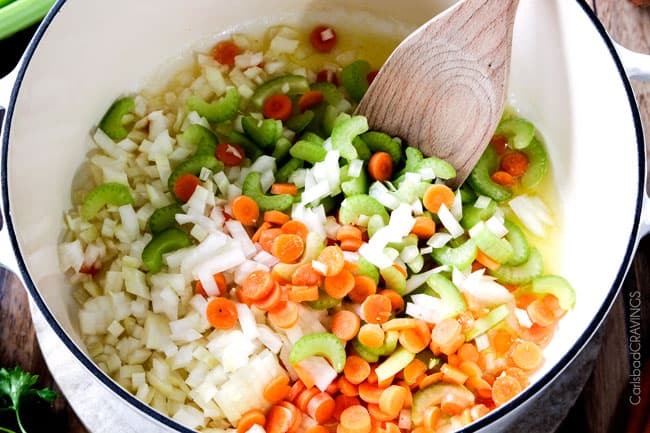 Cook Mirepoix: First, melt butter in olive oil then saute onions, followed by carrots, celery, and garlic. Mirepoix (pronounced “meer-pwah”), is simply a fancy French term for the combination of diced carrots, onions and celery sautéed in butter/olive. Every chef will tell you that every great soup starts with mirepoix because it adds depth of flavor that can’t be achieved any other way. Roux: Next, sprinkle in some flour and cook a couple more minutes. Cooking will get rid of the raw flour smell and raw flour taste, as opposed to just mixing the flour in broth or cream like other recipes sometimes do. The flour will work to thicken our Ham and Bean Soup. If you don’t want a creamy Ham and Bean Soup recipe then skip the flour. Add broth: Next, stir in the chicken broth, chicken broth whisked with cornstarch, white beans, ham and hand picks herbs and seasonings. Again, if you don’t want a creamy Ham and Bean Soup, then skip the cornstarch. Simmer: Bring to a boil, then reduce to a gentle simmer for 15-20 minutes while your house fills with the savory herb aroma. I like to cover my soup with the lid so it comes to a boil more quickly, then remove it while the soup simmers. You will want to simmer for as long as it takes for your carrots to be tender – this will depend on how thick you sliced your carrots. Add Tortellini: Finally, add your tortellini and boil for 2 minutes or so until cooked al dente. You don’t wan’t to overcook your tortellini or else they will fall apart. Al dente tortellini also makes for better leftovers. If you aren’t sure if they are done or not, you can scoop up a tortellini, run it under cold water and taste it, taking care not to burn yourself. Make Creamy: Stir in desired amount of half and half to make Creamy Ham and Bean Soup. If you would like a less “chunky” soup but still want it creamy, then add additional half and half. For a less “chunky” soup that is also less creamy, then thin with chicken broth. Buy/prechop Mirepoix. Chopping the celery, onions and slicing the carrots is probably the most time consuming part of this Ham and Bean Soup recipe, but it’s so worth it. You can chop all your veggies in advance or you can even buy mirepoix by the jar at Trader Joes and other grocery stores for an easy shortcut. Ham Substitute: This is HAM and Bean Soup, but it is also fabulous with other proteins for when you don’t have ham on hand or if you want to mix it up! You can use lean ground turkey, lean ground beef, Italian Sausage and even shredded chicken. Salt to Taste. I usually specify the amount of salt in a recipe, but for this Ham and Bean Soup, you will want to add salt to taste. The amount of salt needed will depend on the saltiness of your ham and what it has already been seasoned with. Once you taste our soup a the end of cooking and if you feel like it is missing something, it is most likely salt. Start with a pinch then add more if needed. How Do I Make Ham and Bean Soup Not Creamy? I love creamy Ham and Bean Soup but you are welcome to make this soup just with broth. To make a non-creamy version, eliminate the flour an cornstarch and replace the half and half with chicken broth. How do you make ham and bean soup thicker? 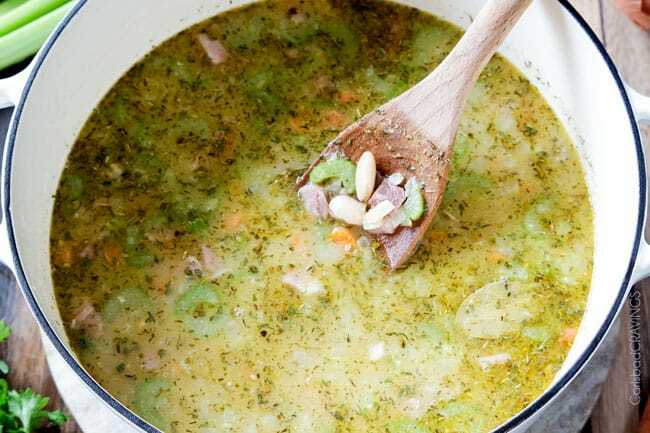 This Ham and Bean soup is made thick and creamy by first starting with a roux, or cooking flour in butter, then adding chicken broth whisked with cornstarch. You can whisk the cornstarch with as little as 1/2 chicken broth, just enough so it dissolves completely into a smooth slurry. By using both a roux and the slurry cornstarch, we are able use less butter and half and half instead of heavy cream. The cornstarch thickens the broth and makes it behave like heavy cream so we get all the richness without the fat. If you would like an even thicker soup, you can use some heavy cream in place of the half and half because the more fat, the creamier the soup. Alternatively, if you are looking for less calories, you can use milk and increase cornstarch to 3 tablespoons but it will not be as creamy. how long will ham and bean soup keep? Ham and Bean Soup should be stored in an airtight container in the refrigerator. When stored correctly, it should keep for up to 5 days, but as with everything, use your best judgment. WHAT GOES WITH Ham and Bean SOUP? Ham and Bean Soup is a hearty meal-in-one, it barley needs a thing! You can keep it simple with a big green salad and garlic bread or crusty bread. If you are looking for a few more refined options, we love it with Garlic Parmesan Breadsticks, or Cheesy Pesto Pull Apart Bread, Wedge Salad. and Fruit Salad. How do I reheat Ham and Bean Soup? 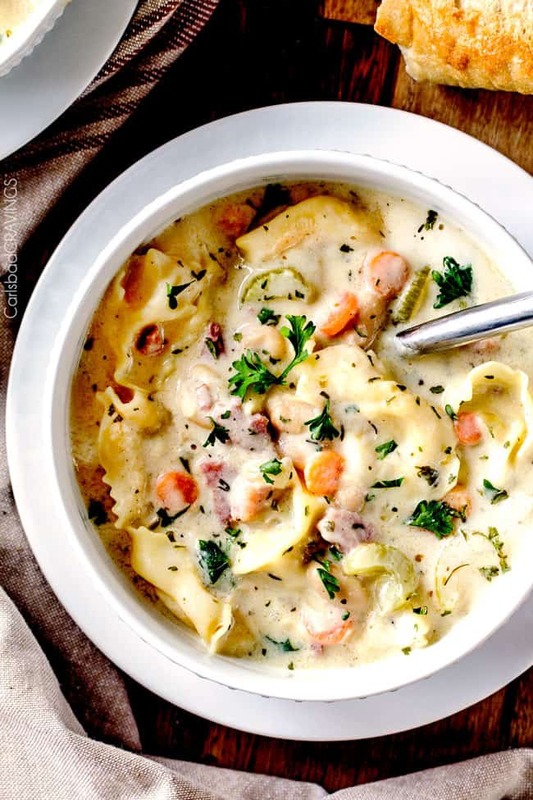 The Tortellini in the Ham and Bean Soup will soak up some of the liquid, so you will want to add a splash of milk to the leftovers and reheat gently in the microwave or stove top. CAN I FREEZE Ham and Bean SOUP? Yes and No. No, I do not recommend freezing completed Creamy Ham and Bean soup due to the creamy nature of the soup and the tortellini. 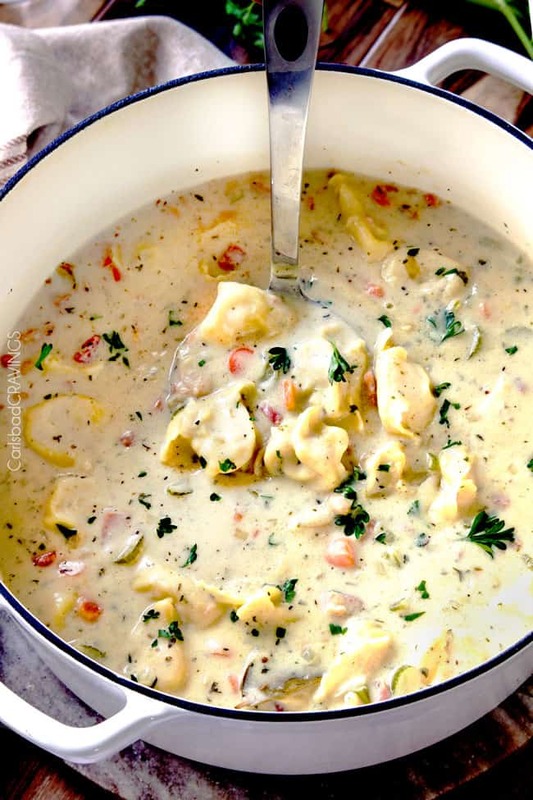 The fat in creamy soups tends to separate when frozen leaving you with an unpleasant texture and the tortellini becomes mushy. You can freeze by preparing the Ham and Bean Soup up to the point of adding the half and half and tortellini. In other words, complete the recipe, but do not add the half and half and tortellini. HOW DO I FREEZE Ham and Bean Soup? Follow recipe up to the point of adding the tortellini and half and half – do not add half and half and tortellini. Add Ham and Bean Soup to a freezer size bag or airtight freezer safe container. Push out any excess air, seal, seal and freeze for up to 3 months. When ready to eat, let soup thaw in the refrigerator. Transfer soup to a Dutch oven/soup pot and warm over the stove. Once simmering, add tortellini and half and half per recipe directions. Ham and Bean Soup. So crazy easy, so hearty, so satisfyingly delicious, so begging to be curled up in a large bowl and adored each spoonful by you. Because you, Santa and the Elf on the Shelf deserve to put their feet up with Creamy Ham and Bean Soup. You deserve your own magic. Looking for more easy soups recipes? WANT TO TRY THIS HAM AND BEAN SOUP RECIPE? PIN IT TO YOUR SOUP, DINNER or ITALIAN BOARD TO SAVE FOR LATER! This Creamy Ham and White Bean Tortellini Soup is the epitome of comfort food on your table in 30 minutes! 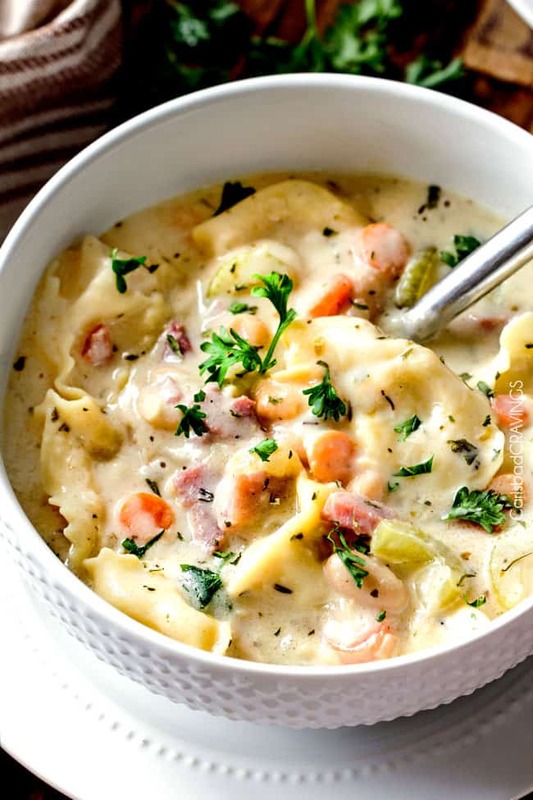 Its simmered with ham, white beans, onions, carrots, celery, seasonings and pillowy, cheesy tortellini. It is lusciously creamy, bursting with flavor, SO easy and lick your bowl delicious! 30 minutes never tasted so good! Melt butter in olive oil in Dutch oven/large soup pot over medium high heat. Add onions and saute for 2 minutes. Add carrots and celery and cook, while stirring, for 3 minutes. Add garlic and saute for 30 seconds. Sprinkle in flour then cook, stirring constantly for 3 minutes (it will be thick). Turn heat to low and gradually stir in 5 1/2 cups chicken broth. Whisk 2 tablespoons cornstarch with remaining 1/2 cup chicken broth and add to soup. Stir in ham, beans, Dijon mustard, bay leaves, bouillon and all remaining herbs and spices. Bring to a boil; cover, and reduce to a gentle simmer for 15-20 minutes or until vegetables are tender. Add tortellini and boil for 1-2 minutes or until cooked al dente. Stir in half and half, adding additional half and half or broth if desired for a less “chunky” soup and warm through. Garnish individual servings with fresh parsley and Parmesan cheese if desired. For a non-creamy version, omit the flour and cornstarch and replace the half and half with chicken broth. but do not add the half and half and tortellini. Didn’t know if you’d given them permission to do that, but I know a lot of sites are stealing recipes so thought I’d let you know just in case. I’ll be pinning from your URL instead. Hi Rachael, thank you so much for letting me know. Pin redirecting is a HUGE problem right now. People find the most popular pins then funnel them to their site – even if its completely unrelated. I’m glad you were able to find the original recipe – I hope you love it! Can I use other white beans, like Great Northern or Navy beans?